This is being typed as I sit at Myrtle Beach State Park. Yes, it is January. As I gaze out over the ocean I have decided that a cold day at the beach, beats a day at the office, or an afternoon spent cleaning house or just about anything else that can be thought about. Waves swish back and forth across the sand as seagulls call to one another. The tangy salt spray dances in the air. Wisps of tall grasses sway gently in the ocean breeze. Snow was falling when we left Tennessee. It is 55 degrees here on the coast. Downright balmy by comparison if you ask me! 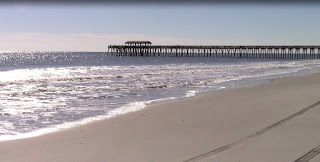 Myrtle Beach State Park isn't like the main part of town, but it is easy to find. A small nondescript sign marks the entrance on Kings Highway. Pull up to the guard shack and let them know if you're camping or just visiting. There is a day use fee, but that's included in the camping price. We only paid $75 and change for three nights, but the price fluctuates seasonally. We were tempted by lots of hotel deals right now. Online booking sites show Hampton Inn and Suites Oceanfront wants only $99 per night and the Mariott OceanWatch Villas at Grande Dunes is asking $139. Those same hotels are asking $229 and $699 for mid-July respectively. 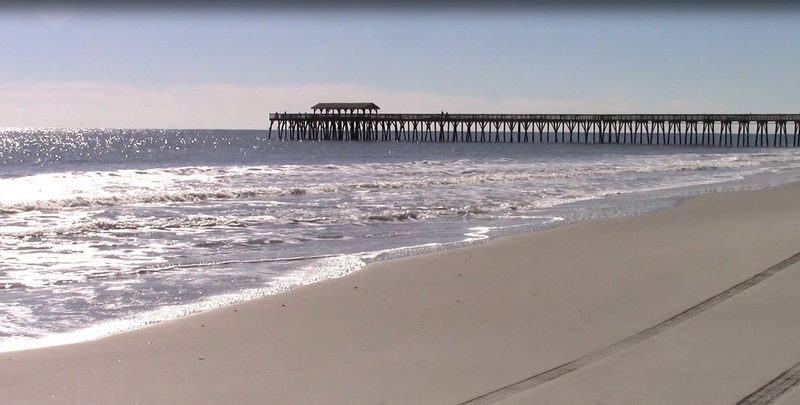 Those prices are a good reason to go to Myrtle Beach during the off-season to me! Although there are plenty of hotels, we chose to camp and are pleased. Our campsite is about 300 yards from the water. The park is on the flight path to the airport so low ]flying planes soar over head. There are pavilions, a nature center, boardwalks, trails and a well stocked camp store. Our campsite has water, electricity, a fire ring and picnic table. The bath house is heated (although barely) and there is hot water. Most of all, there is the opportunity to reconnect with nature. Sea walks, sitting and staring at the waves, listening to the call of the wild. The temperature dropped this evening. Hubby and I barely noticed the change as we sipped hot chocolate by the blazing fire. Supper was hot dogs gently roasted over an open flame. You can't get this at home folks. So yeah, a cold day at Myrtle Beach beats a warm day almost anywhere else.